Pat Bishop, a business executive, painter, musician, historian, media commentator, choreographer and fashion designer, was also a renowned ethnomusicologist who, according to Dr. Selwyn Cudjoe, “sang with the Esso Tripoli in 1967; arranged music for Fonclaire, Birdsong, Skiffle Bunch and Desperadoes Steel Orchestra among other groups; conducted Trinidad All Stars, Phase II, Renegades and other steelbands; performed with Desperadoes at Carnegie Hall, New York, Brooklyn Academy of Music and the Philadelphia Academy of Music.” She also directed music for the Morne Diablo Folk Performing Company, worked with Daisy Voisin’s La Divina Pastora Parang Group and directed the Lydian Singers for the past eleven years. She lectured History at the U.W.I. St. Augustine and Mona campuses as well as the history of art and design at the Jamaican School of the Art between 1970 and 1972. 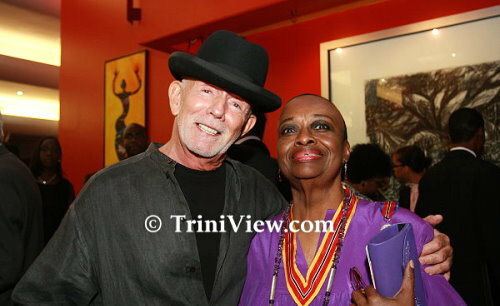 Pat Bishop, whose paintings were exhibited in Jamaica, London, Grenada and Trinidad and Tobago, according to Dr. Cudjoe, has had her work “acquired by numerous local corporations such as the Central Bank of Trinidad and Tobago; Spelman College in Atlanta, Georgia; and various private collections in the United States and the United Kingdom.” Bishop demonstrated that the hats she wore were many. She is a recipient of many accolades and awards including Trinidad and Tobago’s highest award (then named) the Trinity Cross. For her work in promoting and upholding the culture of Trinidad and Tobago and for showcasing it to the world, she will always be remembered. Bishop, 71, passed away yesterday afternoon after she collapsed during a meeting in Port of Spain with Minister of Planning, Dr Bhoendradatt Tewarie, masman Peter Minshall and a number of her cultural colleagues. One of this country’s leading icons in the arts and music, Pat Bishop, passed away around 5.20 yesterday evening. She was 71. From the Prime Minister to the Marionettes Chorale to the singers who knew her best, a wave of tributes poured in yesterday on the sudden passing of renowned musicologist Pat Bishop. Pat Bishop’s legacy will continue to bless the performances of future artistes according to Prime Minister, Kamla Persad-Bissessar. Pat Bishop was a cultural icon who was not afraid to tell anyone what was on her mind. She held to her views and went down fighting knowing she was right in her opinions. Pat Bishop was one of the most versatile Caribbean women of our day. A citizen of Trinidad and Tobago by birth, she was a national scholarship winner from Bishop Anstey High School. It is sad and ironic that shortly before she died, Pat Bishop had been expressing doubts about her own achievements. According to Planning Minister Dr Bhoe Tewarie, Ms Bishop had been talking about past efforts to bring culture into the mainstream, and had said she was sceptical of their success. The late Pat Bishop had described in a written note how she wanted her funeral service to unfold. The document containing instructions for her funeral service was found by her family among important documents at her home. The National Carnival Bands Association (NCBA) has paid tribute to late cultural icon and Trinity Cross recipient Pat Bishop, who died on Saturday evening. At the time of her death Pat Bishop was very concerned about the state of the nation and the way that many working people, through no fault of their own, were being marginalised. The People’s National Movement (PNM) is calling on Government to find an appropriate way to honour the legacy of the late cultural icon, Dr Pat Bishop. The passing of Pat Bishop, as tragic as it must be to her family and friends, is also the end of a remarkable career in the arts in Trinidad and Tobago, one that is largely unparalleled in its polymath range, intellectual complexity and earth deep richness. Pat Bishop was an artist, a teacher, a musician and conductor, but those descriptions seem woefully inadequate in capturing the full range of the work that she did in those fields. Arts and Multiculturalism Minister Winston “Gypsy” Peters has assured that under his direction “things would be put in place” to recognise for posterity, the contributions of Pat Bishop. 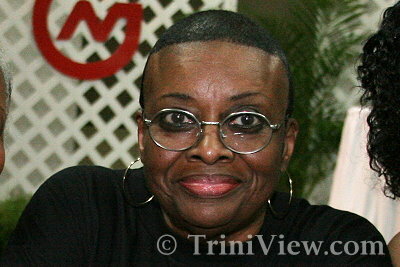 Cultural activist and icon, Pat Bishop died as and where she had lived, among the arts fraternity fighting for the recognition of local culture, and we can think of no greater acknowledgment of her contribution to Trinidad and Tobago than for the nation this year to pay tribute to Ms Bishop with choir and steelband at its 49th Independence celebration. A recipient in life of the country’s highest honour, the Trinity Cross, (now named the Order of the Republic of Trinidad and Tobago), for her contribution to Art and Community Service, it is fitting that Ms Bishop’s death be marked with music and song. Pat Bishop personified creativity, vibrancy, and patriotism. A musical memorial that celebrates the best of TT might also help to soothe and uplift TT’s citizens, adjusting anxiously to living in a limited state of emergency. FOR a woman whose life’s work affected the public so deeply, the funeral service for Dr Pat Bishop yesterday was as private and as simple as one could get. An important cultural leader of the arts has left us all. May angels guide her on her journey she will be sadly missed by all in the performing arts. rest in peace. A great musical icon who impacted this nation tremendously with her multifacited talent,and unique skills,will be sorely missed by all, especially those who like me had the honor of working with her at one point in time with my birdsong pan group family.Rest in peace Ms Bishop. A beautiful person and an inspirational teacher. Her passion for the Arts and for sharing her boundless knowledge will be remembered by many of her students. Thank Goodness for her life. Rest peacefully Ms. Bishop for you are loved, appreciated and respected by many. I see that Mother Pat Bishop has been urgently called to a high-level Board meeting of Cultural Directors in the ‘Upper Room’. When will Trinidad & Tobago begin to take care of and truly honour its own? When will our people realise that we are still merely living in a ‘Glass World’ (naively looking outside of ourselves, while trying to find out what is happening inside our hearts). I personally cherish the mothers of your generation who have done so much for the Caribbean in ‘fathering’ my generation, but with so little support. I can only thank God that you and the many other mothers still with us, have survived your ‘adult stuff’, to tell the tale and contribute meaningfully (through your off-springs and community initiatives etc.) to the wider narrative of life, so that my children and your grandchildren can now stand proudly on their African ancestral shoulders with their heads turned to the SUN, as it rises tomorrow in the East. A true patriot and soldier who fell in the line of duty doing one of the things she loved best, further upliftment of the arts and culture of our NATION. Your work has touched thousands if not millions . On this plane you have done the job you were sent to do. You now return to the realm of the Ancestors from where another chapter of your work begins. We thank you . We salute you for all that you have given us as a people and a nation. Your work and example will serve as continued inspiration for generations to come. May the Gods clear your path as you return. We in trinidad nd tobago have lost a g8 icon when will we learn 2 take care of our icons nd dont wait until they pass on. ONE OF A KIND! “LADY or QUEEN of T&T” you will be REMEMBERED, for GENERATIONS to come. You REST IN PEACE SISTER PAT! Lord please save us from many of these empty pronouncement of how ironic Pat was, now that she is dead , as many of you could not give a hoot ,for any national treasure,that dared to pursue a profession within the artistic sphere, but would kiss the rear end , as well as feet, of any of the hundreds of ego inflated elites, that decided to become a medical doctor, and too numerous of dem donkey braying lawyers , that has infested our society- especially the political arena- for so long. We’ve could have had thousand of Pat Bishops ,emerging from dem Brazalian like fevelas /Trini- Afrikan ghettos of our society,as many earned their stripes in the junior pan yards, of places such as Nelson Street, and Lavantille. To prove my point, where are the island scholarships for dem, and where are the national recognition? The authentic few , like yours truly , loved you Pat. I have always said that there were only two women that ever lived , that I would spend the last dime in my possession ,to sit in a lecture hall , and listen ,as they articulate on any subject, and that’s Pat Bishop , and Maya Angelo. You make us proud , dear Afrikan Queens, and adorers of your race. Long like the conscious artist, and your respective roles in highlighting the often neglected ,Afrocentric kind. On behalf of my sister Vera Frederick Tavernier, who attended Bishop Anstey High with Pat Bishop ,is now incapicated and lives in Canada our heart felt condolences to the family and T,DAD as a whole….T and T have now lost THE MAYA ANGELOU of T,DAD.culture…. Peace to all. God bless her. There is not a lot to celebrate about my once beautiful Country. Rest in peace my lovely.